The kitchen is often the center hub of many homes. It tends to be the place where families congregate before leaving for the day and upon their return from work and school. It’s the place where we can often times make the most changes to improve our health and our well being. This is why it’s a great place to start when it comes to creating a healthier environment at home. And one of the best ways to begin is by looking inside our cabinets and drawers. The materials we eat off of, drink out of and store our food in can play a huge role in the health of our bodies. Over time our society has slowly replaced many of the natural materials in our kitchen products with plastics and man-made materials that contain various toxins. We’ve spent the last several decades heating up food on plastic plates and storing our food in plastic bags, allowing our food to absorb toxins, which we then put in our bodies. The good news is that we are finally shifting our focus from cheap plastic materials to natural materials like glass and stainless steel. We’re getting back to the basics and leaving the man-made plastics and toxic materials behind. But it can feel completely overwhelming when you’re peering into a cabinet full of plastics. It can be difficult to know where or how to begin when you want to replace the majority of your products. The good news is that each tiny step forward in the grand scheme of things is an improvement. You don’t have to change your whole kitchen at once, but you can change it bits and pieces at a time. The other good news is that often times we have much more than we even need when it comes to kitchen dishes and food storage. Chances are you can get rid of some things without ever missing it. Then you can simply replace what’s truly a necessary item in your kitchen with a natural, eco-friendly option. Plastics are made with synthetic chemicals and petroleum by products. This is just one of the ways it can be harmful to your home. The reason food storage and plastic in the kitchen is so much more dangerous to our bodies is the fact that they are touching the food we ingest. That means it gets a fast pass directly to the bloodstream, traveling much more quickly to the rest of our body and organs. Plastics that are soft and moldable are made out of plasticizers, which are much more dangerous to the body in comparison to firm and unmovable plastic products. These plastics are especially potent when they are heated, either by warmed food sitting on them or food being heated directly on the surface in the microwave. Plastic toxins have been found to stay in the body for long periods of time as well. The chemicals have been detected in urine and even in breast milk long after exposure to the plastic material. One of the biggest affects on our health is the fact that plastics disrupt our natural hormone production. This endocrine system disruptor can affect everything from causing hyperactivity in children to causing long term reproductive issues for adults. It can also cause issues with regulating hormones, which has been linked to Type II Diabetes and obesity in children. Plastics have also been found to alter the immune function and depress the immune system so that it isn’t as strong or able to work as hard as normal. This means the body is not able to fight off viruses and bacterial infections like it might if the immune system were healthy and strong. What’s even more is that our body has very few breaks from plastics. Our world is filled with plastic chemicals and materials, and our body is constantly being burdened with them. Any place we can reduce the amount of plastic used is a healthy start for our bodies and families. Reducing toxins and eliminating harmful products is easier than you think. 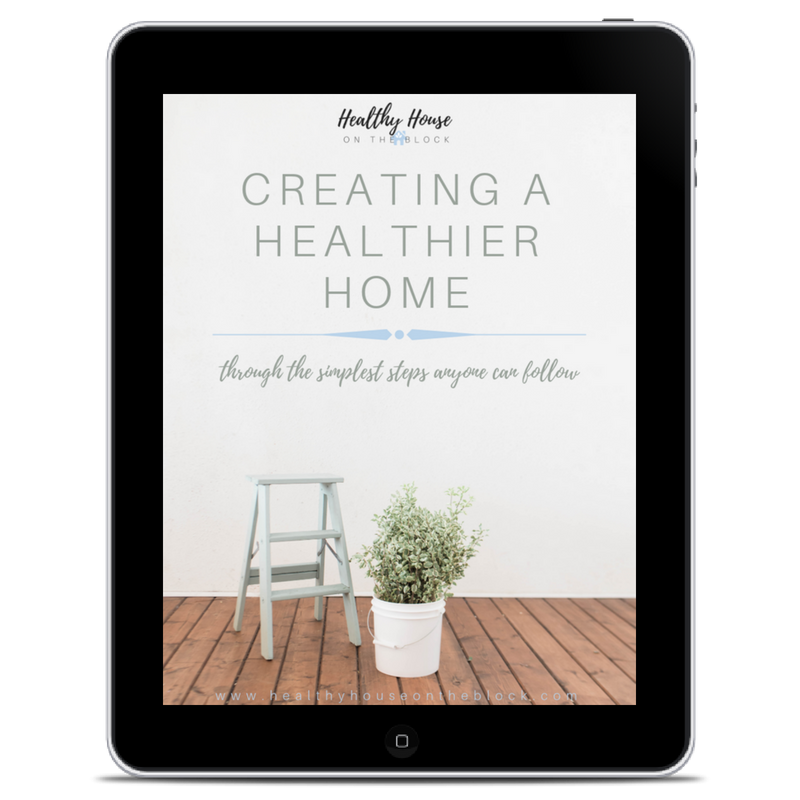 Download my free e-book to get started. We’ve been told that BPA free plastic is 100% safe and completely free of dangerous toxins. But unfortunately, this is not the case. BPA free does not mean that the plastic is free from toxins and chemicals. It means that the alternative to the BPA is simply different than the toxin in BPA. The truth is the other plasticizers that are added to take the place of the BPA are just as toxic to the body and still stay in the body for a long period of time. In addition, phthalates, which are also plasticizers used to make plastic soft and moldable are still used which is a known carcinogen and an endocrine system disruptor. This means that the hormonal system in children is being affected for the length of their life. This is oftentimes one of the simplest and easiest ways to reduce the amount of plastic in the kitchen. Getting rid of inexpensive plastic water bottles and replacing them with just one or two glass or stainless steel water bottle is an excellent place to start. Many of us have cabinets full of water bottles and really, we only need one or maybe two at a time. Getting rid of what isn’t needed and replacing just the basics is one of my best recommendations for anyone aiming to reduce plastic. If you have kiddos in your home, chances are you have more plastic cups than you know what to do with. It can be difficult for kids to drink out of glass tumblers due to their weight and fragility. You can either buy silicone wrapped glasses or stainless steel cups for kids that are a much healthier option. Another option for families with older children is to use a juice glass for meals. This is a great option as they are usually lighter in weight and smaller in size. They are perfect for little hands and safe for little mouths. Ikea is a great place to start if you’re looking to purchase just a few glasses at a time as you don’t need to buy an entire set. Straws make everything easier to drink it seems like. If you’re house enjoys smoothies like mine does, then you know straws are a must. But plastic straws are not only bad for our health as they are made of flexible plastic, they’re also harming our environment as well. One-time use plastic straws can be replaced with either silicone straws or stainless steel straws that can be washed and reused again and again. Those aisles at the store filled with throw-away plastic food storage may seem filled with convenient options for the busiest house, but really, they’re just another way our homes are becoming filled with unsafe materials and bad habits. These plastics are also made with the softest plasticizers, which means the chemicals and toxins are leaching into food at a much quicker rate in comparison to the hard plastic plates or bowls you can purchase. Heating these plastic containers is another way that more of the plastic toxins and chemicals can leach into the food you’re about to consume. For these reasons, glass is one of the best alternatives. As a mom who packs a lot of snacks and lunches for school, I get the convenience that comes along with a plastic food bag. I know that for me personally, it’s been one of the more difficult items to replace in my house. We’ve grown up with these bags and stored everything from left-overs to snacks in them. Plus I don’t have to hope my kids remember not to throw them away or lose them. But if you can begin to change a few snacks or lunches per week over to a more sustainable and healthy option, it will become easier and easier to begin replacing those bags completely. Lunch containers are often made of plastic and plastic silverware has become a normal part of the to-go lunch. But these products are not only harmful to the environment, but harmful to us as we eat foods that are greasy and acidic off of them. More toxins leach into foods with large amounts of acidity or oil and end up in our bodies. Lunches can be completely plastic free — even lunches being packed for kids. I pack my kids real silverware and I try to use stainless steel containers for food and snacks. However, if your silverware seems to be disappearing and not coming home, you can purchase bamboo or wood utensils that are completely safe and recyclable. Baby bottles have gone from glass to plastic and back to glass again — which is good news. But there are still plenty of baby bottles and sippy cups that are being made in plastic materials. The reason that plastic has been so widely used in the kitchen is that it won’t break when children drop it. And we all know that children drop items all the time and we want to avoid any dangers for example if they were to drop glass there would be glass everywhere. So let’s look at the best alternatives to Plastics and see if there’s one that you would be willing to change out or use in your house. Glass bottles are definitely making a comeback and they’re safer than ever before. Glass bottles and glass sippy cups now come with safe silicone wraps around them which protects the glass from shattering and breaking if your child were to drop it. Because bottles are generally warmed or contain warm substances in them it’s best to opt for glass or they also make stainless steel bottles as well (but they can’t be microwaved). Glass in general will wash the best and is the safest option when it comes to a bottle. Another option would be as I mentioned stainless steel. Stainless steel cups and bottles are readily available even in big box stores like Target if you’re looking to go that route. I think these are a great option for things like water bottles they don’t hold on to any smell or taste and they’re easily transported in diaper bags and can be made to be leak-proof. Other options for things like plates and bowls would be silicone this is a safe alternative to soft Plastics. Another option would be ceramic however you’ll just want to make sure that it has a lead-free glaze. Anything that is purchased brand new obviously there is regulation against lead being used in Kitchen products. However if you’re purchasing something older you may want to just verify that it is lead free. And finally you can go with a solid wood or a bamboo just make sure these are coated with non-toxic food-safe finishes. Generally if you’re purchasing a plate or a bowl or silverware that is made of bamboo it already has to be approved to have a food grade finish.